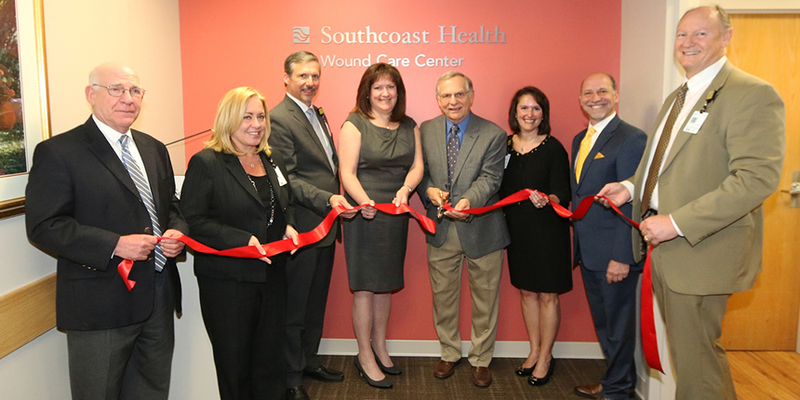 Center is the second Southcoast Health has opened in affiliation with Healogics, Inc.
Southcoast Health cut the ribbon, on May 7, 2018, on its second Wound Care Center, which will bring advanced, specialized care for acute and chronic wounds to St. Luke’s Hospital. This Wound Care Center will bring the same high standard of wound care that is already available at Charlton Memorial Hospital, in Fall River, where the Southcoast Health Center for Wound Care and Hyperbaric Medicine opened its first location in 2010. Southcoast Health decided to open a second outpatient location because of the high demand for advanced care for chronic wounds caused by diabetes, venous insufficiency, radiation treatment and other conditions. Often, patients come to the Wound Care Center after years of failed treatment by standard measures. A team of specialty physicians, nurses and one nurse practitioner will staff the new Wound Care Center. All staff are clinical experts in wound care and hyperbaric medicine. The Southcoast Health Wound Care Center is affiliated with Healogics Inc., which is the nation’s largest provider of advanced wound care with nearly 800 partners nationwide. Healogics maintains the largest database of wounds in the world and serves as a resource for wound care research. Southcoast Health contributes to the database with its own patient population and experience, helping to advance the industry in understanding optimum wound treatment and best practices. Last month, Healogics recognized the Wound Care Center at Charlton Memorial as a Center of Excellence. To be eligible for the award, the Center had to achieve outstanding clinical outcomes for a minimum of two consecutive years, including a patient satisfaction score higher than 92 percent, a wound healing rate of at least 91 percent in less than 30 median days to heal. “The Wound Care Center strives to deliver quality care that addresses the wound healing process. Last year, we were able to successfully achieve a median of 28 days,” said Cheryl Thompson, RN, program director of the Southcoast Health Wound Care Center. The Southcoast Health Wound Care Center offers the latest treatments and dressings, such as negative pressure dressings that remove drainage from the wound, specialty products, compression therapy for lower leg, ulcers, and full contact casting that eases pressure on diabetic foot ulcers. In addition, hyperbaric oxygen treatment is available at Charlton Memorial for all eligible Wound Care Center patients. The single person pressurized chamber delivers 100 percent oxygen to reduce swelling and promote healing.